Kelly left the Tokyo Detention Center with his lawyer, Yoichi Kitamura, by taxi at around 10:45 p.m. local time, a Reuters witness said. 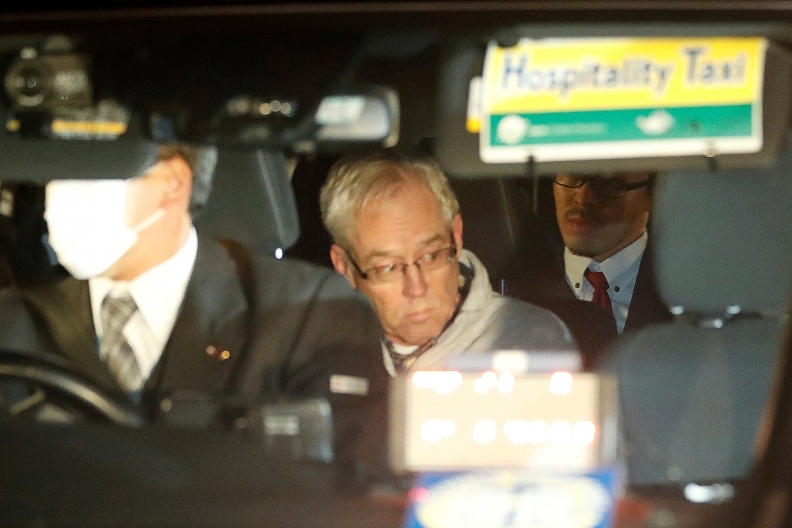 TOKYO -- Former Nissan Motor Co. executive Greg Kelly has been released on bail after more than a month in detention on financial-misconduct charges, as a Tokyo court rejected prosecutors' request to keep the American executive in custody. Kelly and Carlos Ghosn, the automaker's ousted chairman, were detained upon arrival in Japan on Nov. 19 on suspicion of understating Ghosn's income in financial statements for several years. The arrests jolted the global car industry and strained Nissan's alliance with French car maker Renault SA. Ghosn remains in custody. A crowd of Japanese and international reporters and camera crews had gathered since Tuesday morning waiting for Kelly's release. He left the Tokyo Detention Center with his lawyer, Yoichi Kitamura, by taxi at around 10:45 p.m. local time, a Reuters witness said. Kelly said in a statement that he had not falsified any documents and looked forward to restoring his honor in court, adding that he wanted to return to his family as soon as possible, Japanese public broadcaster NHK reported. “Today I returned to the outside world after making bail,” Kelly said in a statement provided by his lawyer to NHK, which was broadcast in Japanese. “I look forward to receiving a court judgment of innocence, restoring my name, and returning to my family as soon as possible." There was no answer at Kitamura's office when contacted by Reuters for comment. The ruling by the Tokyo District Court came after an appeal by Kelly's family in Tennessee. He paid bail of 70 million yen ($640,000) in cash, the court said. But he could be barred from leaving Japan or talking to people related to the case, NHK said earlier in the day, although exceptions can be made for overseas travel on a case-by-case basis. A Nissan spokesman said the car maker was not in a position to comment on the latest twist in the more-than-month-long saga. "The company's own investigation uncovered substantial and convincing evidence of misconduct, resulting in a unanimous board vote to dismiss Ghosn and Kelly as chairman and representative director. Our investigation is ongoing," the spokesman said. Both Kelly and Ghosn remain on the Japanese car maker's board but without representative rights. The court on Sunday extended Ghosn's detention for 10 days, following fresh allegations of making Nissan shoulder personal investment losses. Prosecutors also said Ghosn had inflicted damage on Nissan by having it deposit a total of $14.7 million on four occasions between June 2009 and March 2012 into a related bank account. Ghosn will remain in Tokyo's main detention center, where he has been confined since his arrest in November, at least until Jan. 1. Dee Kelly also said several U.S. government officials have supported efforts to arrange for his return to Tennessee. Inside Nissan, Kelly was known as the CEO whisperer: The chief of staff who would deliver the most delicate messages to Ghosn, and the man Ghosn would count on to enforce his directives. Kelly was locked up in a small Tokyo jail cell with a toilet and wash basin, cut off from Ghosn and barely able to speak with his own lawyers in the past month. Nissan, in a separate statement, said it modified its corporate governance code, allowing it to sell Renault shares if it deemed the cross-shareholding structure inappropriate. The Japanese company’s alliance with the French carmaker has become more strained since the arrests, although both companies have publicly said they weren’t looking to reconsider the current structure.